The bookstore’s history is not what you’d call conventional either. 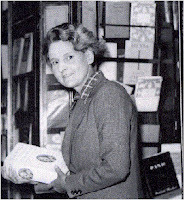 In 1951 Whitman established the Left Bank shop as Le Mistral. But in 1964, he adopted its current name to honor Shakespeare on his 400th birthday and another New Jerseyite who had passed away two years earlier. Which brings us to the centennial part of the story. You see, Whitman didn’t come up with the name Shakespeare and Company. Full credit goes to Sylvia Beach. The minister’s daughter began her love affair with the City of Light after spending three years there with her family at the turn of the twentieth century. Returning in 1917 to study French literature at the Sorbonne, she came across a bookstore/lending library owned by Adrienne Monnier. Beach then decided to set up a similar shop dealing with avant-garde American and British writings. Thus began a combined passion for books and for each other which would last until Monnier’s death in 1955. Monnier actually discovered the former laundry at 8, rue Dupuytren where Beach first opened for business on November 19, 1919. The warm, cheerful ambience Beach created at Shakespeare and Company reflected her nurturing personality and attracted expat Americans and French patrons alike— including writers like feminist Simone de Beauvoir and future Nobelist André Gide. Eighteen months later, once great numbers of our compatriots began flocking to Paris, Beach needed more room. So in May 1921 she moved lock, stock, and barrel to 12, rue de l’Odéon, a two-minute walk away. American “literary royalty”—the likes of Hemingway, Fitzgerald, Stein, and Eliot—became regulars at the bookstore. And not simply to buy books, mind you. The intellectual center Beach created allowed authors to discuss literature, critique works, arrange for typists, borrow money, and in some cases get their works printed. The prime publication being Ulysses by James Joyce. Considered obscene in the U.K. and the U.S. at the time, the novel found its savior in Sylvia Beach. A kindhearted person, yes, but also an ardent defender of great literature against what she called the “dark age” of censorship. To bring Ulysses to light in 1922, she took on the enormous responsibility of editing and publishing the 730-page novel—serving at times as Joyce’s literary agent, banker, and secretary. Even performing menial tasks for the author—to Monnier’s shock and displeasure. But big problems lay in the decades to follow. With the Depression, the unfavorable exchange rate, and the threat of another war during the 1930s, Americans abandoned Paris and the bookstore fell on hard times. 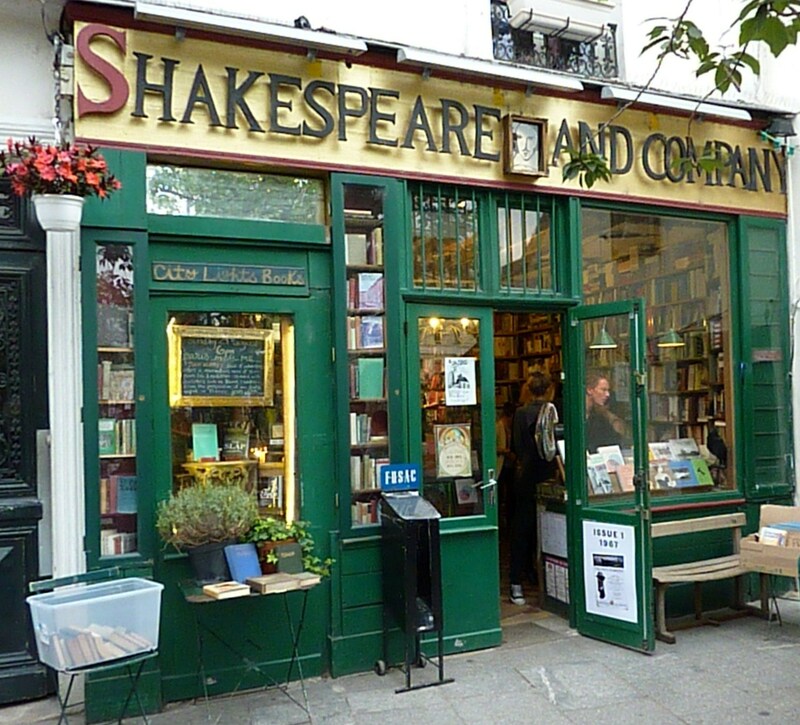 Yet, Ms. Beach was so admired and appreciated that Gide organized The Friends of Shakespeare and Company which set up fundraising readings and annual subscriptions to help keep the shop afloat. 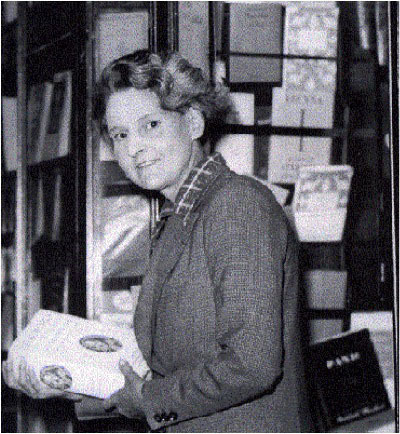 In 1941 when Beach wouldn’t sell a high-ranking Nazi officer her personal copy of Finnegans Wake, he threatened to have her books confiscated. That day she and friends moved the stock up to an unoccupied third-floor apartment, a carpenter dismantled the bookshelves, and a painter covered over the outdoor sign. During a roundup of Americans the following year, Beach was imprisoned for a time with other women in the zoo of the Bois de Boulogne before being sent to an internment camp in Alsace for six months. Although she never reopened the bookstore after the war, a white plaque on the rue de l’Odéon indicates the important history associated with the building. So the next time you’re in the market for something to read, think of the woman one critic called “the patron saint of independent bookstores” and her shop in the 6th arrondissement of Paris. Happy 100th anniversary, Sylvia Beach. Read more about Sylvia Beach and other famous expats in my recently published book--Pilgrimage to Paris: The Cheapo Snob's Guide to the City and the Americans Who Lived There.